The second assessment we perform is our Surface ElectroMyoGraphy (SEMG) scans. These scans are completely harmless, pain-free, and radiation free. This scans uses highly sensitive sensors that are placed along the spine to analyze the efficiency of the nervous system. This scan is an incredible tool for analyzing the nervous system. 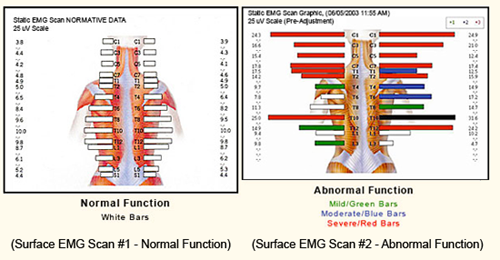 A spine out of balance puts abnormal tension on your nervous system and will show up on our EMG scan. We will use the same grading scale as we did on the thermal scan with white bars being most desirable on both sides of the spine. We also want to see a pear shaped pattern to the scan. The reason for this being that as we move down the spine we reach the areas of the core and our vital organs, which need more nerve supply in those areas than others. So when looking at our scans these are important qualities to look for. Anytime we see bars that are green, blue, or red these indicates areas of mild, moderate, or tremendous levels of stress on the nervous system. The other color we may see is areas of yellow bars. Typically we find this toward the middle of scan. This indicates areas of exhaustion in the nervous system, which tells us that those areas have been working so hard that they can no longer keep up with daily demands. This is very common with patients who suffer with chronic fatigue, who inevitable end up experiencing greater amounts of energy as we restore proper function in those areas. These are the critical components that we look for when analyzing your SEMG scans. Again, look to your Nerve Chart to see where areas of stress or fatigue may correlate to chart. It’s important to know that every scan is different and our care for each of our practice members is different. During your restoration care phase your scans may appear “worse” or you might see more colors than before. This is normal and can be a very good thing. You see the goal of these scans is to truly understand how your body has been able to cope and adapt to the stresses of life, whether they be physical, chemical, or emotional. As we go through our restoration phase, we may “unpack” stress and the spine and nervous system start to change and adapt. This can lead to increased amounts of energy in the system. You will also see 3 numbers on the right side of your scans. These are some quantitative values to help us monitor your progress as well. Pattern and Symmetry scores tell us how is the balance and symmetry of the nervous system. The more balance we have the better. We don’t want to drive our car on just one side and our body is no different. For both these values we want to see 70 and above. The other value you will see is Total Energy. Total energy tells us how efficient your nervous system is. This value we want to see as close as we can get to 100. Imagine you are driving on the free at 65 mph but your RPMs are close to 9000. Your car is wasting tons of energy to get the job done and working much harder than normal to do the job. You want your car running at 1-2000 RPMs so your car can run more efficiently. The higher your total energy is, the more energy your body is having to use to get the job done. The more energy your body is wasting the less energy your body has to do everyday activities. This can lead to increased fatigue and more overall stress. When the body feels this increased stress it drives your nervous system toward increased sympathetic activity. Sympathetic activity is the “fight or flight” or stress side of your central nervous system. This side is only intended for short periods of time as needed. When the sympathetic nervous system is engaged it can lower immune system activity, decrease adaptability, decrease adequate sleep, increase blood pressure, and wreak havoc on your health.